I mentioned earlier this week that my sister and I did a small crockpot freezer meal session this weekend. I call it small because it was just the two of us and we did no actual cooking during the session; all of the meals were "dump" meals where all the ingredients are raw and are dumped into freezer bags. If you are just starting out with freezer meals, I would suggest doing these kind of meals because it keeps prep to a minimum. We did 6 different recipes and only one meal per recipe for each family because all of the recipes were new. 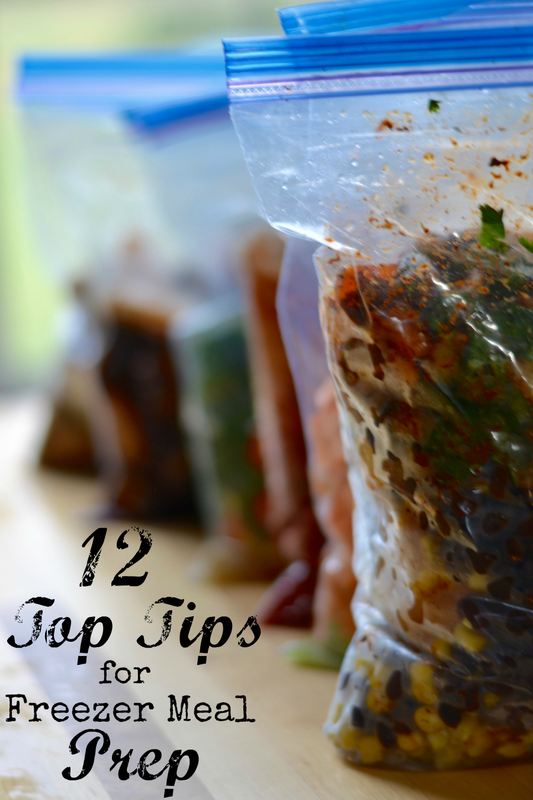 Over the last 12 years or so, I've done different versions of freezer meal prep, but there are several tips that I can give you, whether this is your first freezer prep session or your tenth. So what tips can make your freezer meal session a success? Plan meals that you think your family (or families) will like. I believe in challenging my family in meals that they eat. However, pick your battles. Maybe try one new ingredient. Or in a week's worth of meals, have some favorites mixed in with one or two new meals. As I mentioned above, all the recipes we did last weekend were new, so we only did one per family. We did pick recipes that we felt would receive less "pushback" from our families. Either they were familiar flavors or we similar enough to other dishes that we felt the kids would survive. Take advantage of freezer meal resources. All of the recipes that my sister and I used were from Super Healthy Kids. In the past when we did a much larger cooking group with friends, we used Cooking Beaches. I also have a book that I'm just starting to use, Don't Panic, Dinner's in the Freezer (affiliate link for your convenience). Plan your session with a friend or two. I've done freezer meals by myself and with others, and by far, it is easier with a friend (or more). Each person takes 2-3 meals, and before you know it, you're already done. Or if you prefer, each person takes a type of ingredient (meat, canned goods, produce, etc) and checks it off the ingredient list as you put it into the bag. Use a mixture of flavors, meats, and meal types. If you do this, your family will be less likely to be bored with the recipes. Even though all of these recipes are made in the slow cooker, the results are very different. We did 6 recipes. Two used stew beef, two used chicken, and two were vegetarian. Three were soup/stews, two were to be served over noodles or rice, and one is a flexible filling for tacos, tortillas, or nachos. Shop sales as much as possible. I was able to use frozen meat in my meals that I had purchased previously, which will drastically reduce the price of doing freezer meal prep. I realize that freezer meal prep can be a big outlay for a family who is used to grocery shopping every week, but if you plan your session a few weeks out, and use a decent amount of pantry staples that you buy each week, you can save a lot, too. Not including the meat, 12 meals cost around $65 for the twelve meals for us. We did not shop the sales for the pantry staples, but went to Aldi for the grand majority of the items. Plan meals that overlap some ingredients, or has a bunch of ingredients you usually buy. This is especially important if those ingredients are a little exotic. Almost everything is less expensive when you buy in bulk. We were able to keep our costs down because we had most of the spices on hand needed for this session. Shop a different day that the prep session. You want to be fresh for the prep session. No matter how much you plan, you are prepping a bunch of meals. Split it up. Trust me. Your feet and back will thank you. Your family will thank you too (you'll be less grumpy). Make a station for each recipe. Print out the recipes and cut them apart to put at each station. You can have a station for items that aren't easy to divide up, but it helps to have each recipe laid out as much as possible. This helps catch items that might have been missed in the shopping session. We had one item that my sister missed picking up from her house and doing the stations helped catch this. Label your bags before you start. Label the dish name, any items that need to be added at the beginning or end of cooking, and cooking times. This cuts down on mystery meals or last minute shopping trips when the dish has been cooking in the slow cooker all day. If there are ingredients that someone will turn their nose up on, the food processor is your best friend. In our most recent freezer meal session, my sister and I decided that celery and onions were the most likely to cause texture issues with our kids. Our solution: use a food processor to cut them up somewhere between a mince and a puree. Keep in mind our kids aren't allergic or even against the taste of these foods, just the texture. There's the added advantage that in the 12 meals (6 recipes, one for each of our 2 families) we were cutting up a lot of veggies, including 11 onions and 4 ribs of celery. Using the food processor made things a lot easier, and my eyes sting less if I cut onions in the food processor. Use a colander and/or a sieve. When you are draining canned foods and rinsing all kinds of foods, a colander is indispensable. We drained beans and then rinsed them to control the salt, used a colander to rinse veggies, and used a sieve to wash quinoa. What are your tips to make a freezer meal session a success?